THE much-anticipated sale of Consolidated Pastoral Co has started, with the company announcing overnight that it has sold its prized large-scale channel country bullock fattening depot Nockatunga Station. The buyer is Malcolm Harris and family’s Cleveland Agriculture, which already operates a string of large scale pastoral assets across Northern Australia. Speculation suggests a price as high as $50 million, including 5000 head of cattle and station plant. Widely regarded as one of the state’s best bullock depots, 852,000ha Nockatunga is located in Queensland’s far southwest corner, 125km west of Thargomindah. In a statement issued overnight, CPC described Nockatunga as a ‘non-core’ asset. The company emphasised that the Nockatunga sale did not flag a broader decision by owners Terra Firma to necessarily sell the remaining 15 properties in the portfolio on an individual basis. A CPC spokesperson said interest continued from potential buyers considering acquiring the remaining entity as a whole, through the process being managed by Goldman Sachs and Knight Frank. In the company statement, chief executive Troy Setter said the divestment of Nockatunga reflected the quality of the station and its potential for further development. “Malcolm Harris and his team share our vision for investment in land development and precision pastoral management,” he said. Mr Setter was on an international flight this morning, and was unable to provide further comment to Beef Central. The statement said the sale of Nockatunga Station “at a strong premium to net asset value” reflected the quality of CPC’s properties and their investment history and potential. “The remainder of our portfolio has strong geographic diversity and remains attractive to buyers as a whole or in parts. The ongoing sale process for CPC has always been and continues to be for the business as a whole or in parts,” it said. “While there have been some challenging seasonal conditions in some areas of Australia, CPC’s geographically diverse portfolio positions the business well in the current market and season. The business continues to perform well, benefitting from investments in properties and genetics, as well as our Indonesian supply chain and strong demand dynamics for beef in Asia and around the globe,” Mr Setter said. Regardless of CPC’s reassurances, the Nockatunga sale adds weight to recent market speculation that CPC may be inclined to break up its portfolio of cattle properties stretching across Queensland, the Northern Territory and northeastern WA, as part of the ongoing sale process. The removal of a bullock fattening depot of national significance like Nockatunga from the sale process must impact the strategic value of the overall portfolio, property observers said this morning. Others said the Nockatunga sale might make the remaining CPC assets more ‘approachable’ for a portfolio-type buyer, in terms of size, especially one focussed more heavily on live export. Buyer Malcolm Harris said he looked forward working with the experienced management team at Nockatunga. Mungindi-based Mr Harris and family’s Cleveland Agriculture operates large-scale irrigated and dryland cropping and grazing operations across four states and territories. In 2016 the Harris family bought Benmara Station on the NT’s Barkly Tablelands, a 450,000ha property with an estimated carrying capacity of 20,000 head of cattle. A price of $12 million was suggested at the time. Benmara was added to the Harris family’s existing NT holdings, 5000sq km Rockhampton Downs on the Barkly east of Tennant Creek, and Gogo Station in the Kimberley region of Western Australia. In 2016 the Harris family joined prominent privateer northern beef producers Stirling Buntine, Tom Brinkworth and Viv Oldfield to mount a $386 million bid for S. Kidman & Co, ultimately losing-out to Gina Rinehart’s consortium involving a Chinese minor shareholding. Logic would suggest Nockatunga will be used by the new owners to grass-finish young cattle bred on Cleveland Agriculture’s breeding properties further north. Like other properties in the channel country system, Nockatunga in a good year receives beneficial flooding, providing an abundance of high quality feed including native sorghums and herbage, while outlying areas support Mitchell grass plains, which cover two thirds of the property. In a good season Nockatunga is capable of turning off 12,000 feeder steers/ox with average capacity levels of around 22,000 head. A small breeder herd of 1500 cows is run by CPC on harder country on the property, while the remaining capacity is filled with CPC-bred weaners from the North trucked in yearly for replacements. Bought by CPC in 1990, Nockatunga is used to produce grass finished export bullocks from cattle bred on Isis Downs, Mimong and the company’s NT stations. Grown out from weaner-age and older, the steers are trucked to Queensland coastal abattoirs to be supplied to the Asian markets. 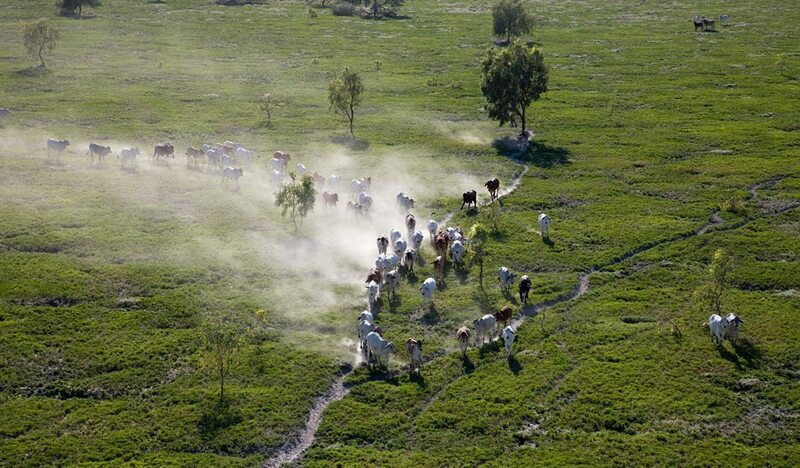 The Nockatunga sale reduces CPC’s pastoral asset base from 5.5 million hectares to 4.7 million hectares, and cattle numbers from around 400,000 head to 380,000 head, run on 15 properties.